The Baltimore Ravens have hired former Patriots defensive coordinator Dean Pees as their linebackers coach. Ravens head coach John Harbaugh announced the move Tuesday morning. "I've know Dean for 27 years, and he's our type of coach -- energetic, hard-working and innovative," Harbaugh stated. "He has worked with all three levels of defense -- defensive line, linebackers and secondary. His experience and wealth of knowledge speak for themselves. Dean has also earned respect from his players and fellow coaches because he has been a coordinator. He'll help our linebackers complement the guys up front and in the back end. He'll fit in with us well, and we're excited to get him." Pees, 60, who served four years as defensive coordinator and two years before that as linebackers coach under Bill Belichick, announced on Jan. 14 that he wouldn't renew his contract with New England. Pees has deep-rooted connections to the Ravens and Maryland. He served as the Naval Academy's secondary coach from 1987 to 1989. He also was Harbaugh's defensive coordinator during the 1983 season at Miami (OH) University, where Harbaugh played defensive back. Said Harbaugh of Pees: "He was the one coach who thought I could play." 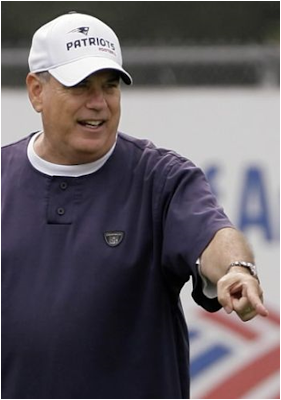 Pees, who also coached with Ravens defensive coordinator Greg Mattison at the Naval Academy in 1987-88, said in a statement: "It's a privilege and an honor to be a part of an organization like the Ravens. I'm very anxious and excited for the opportunity to work with Coach Harbaugh and also Greg Mattison, with whom I have coached. I think this is a tremendous opportunity and something that my family and I are very excited about. I can't wait to get to work." The Denver Post and other sources speculated last week that Pees would reunite with friend and former colleague Josh McDaniels and be named the Broncos' defensive coordinator. Vic Fangio, who has coached the Ravens' linebackers for the past two seasons, will not return to the staff.